Good family films make you feel like a child again. In one respect, Beethoven succeeds on that level — it certainly made me want to lie down and take a nap. Charles Grodin, the latest victim of a career setback caused by co-starring in a film with Jim Belushi, returns as the gruff, money-obsessed father of a family who adopts a lost dog. 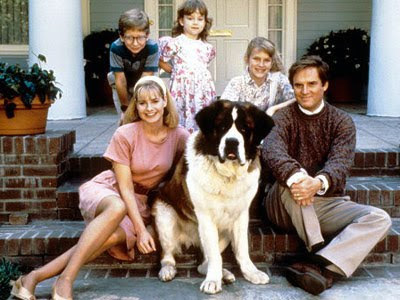 Grodin's character hates dogs — especially large St. Bernards like Beethoven that he fears will wreck his life. Grodin should have been more concerned with a movie this lame wrecking his career. Beethoven tells the story of the young St. Bernard's life from puppydom to maturity. It seems that Beethoven was stolen from a pet store where he was destined to be used for experiments by the requisite evil authority figure. Happily, a canine pal escapes with Beethoven, sparing both from the dastardly plot. Alas, the moviegoer has no such luck. The film itself contains nothing else so original. It takes every cliche from every dog story ever told. From urination to drool in the shoes (a sly reference to Turner & Hooch), every plot development conveniently provided alongside typical superdog twists. I checked the writing credits and lo and behold — guess who gets half credit for concocting this mess? None other than John "King of Formula" Hughes. This St. Bernard truly earns his sainthood — he gets the oldest daughter a date, allows the son to get the better of bullies and saves the youngest girl from drowning. The kids are your standard sitcom variety — bland and talentless Stepford Child performers. As in most family TV shows, Grodin's family contains the requisite three kids. A sappy musical score even accompanies the film, substituting for the fourth child TV families inevitably get in the third or fourth season. Yes, all the TV elements show up — yuppie foils, sensible mother, frazzled father, bullied kid, little daughter who speaks rhythmically, oldest child with a streak of rebellion, evil authority figure, the dog's canine pal. Beethoven houses neither anything new nor good. The movie needed to be put to sleep so the audience could be put of its misery.